If we had a cure for diabetes, we would be so happy. No more needles or pills We wouldn’t have to consider how every tasty morsel we put in our mouth would raise our blood sugar, or remember to exercise even when we would rather sit in our easy chairs. We wouldn’t have to do regular fingersticks, despair over our A1C levels, or moan about our BMI. We could relax. When Dr. Frederick Banting isolated insulin in 1922, the world hailed him for discovering the cure for diabetes, awarding him and Professor J.J.R. Macloud the 1923 Nobel Prize in Medicine. Insulin is life-saving for anyone with type 1 diabetes, but we all now know that it is no cure. Ever since then, people with diabetes have longed for a cure. And the diabetes organizations are glad to oblige. “Just give us your money and we will cure it for you in another 10 years,” is the message we keep hearing. “The Tour de Cure” is perhaps our biggest annual event. If and when a cure for diabetes finally arrives, I will be delighted for all those people with type 1 diabetes who will be able to lead a normal life. I would also cheer for all those people with uncontrolled type 2 diabetes who could avoid the awful complications that they otherwise face. I could finally retire, and now at age 79, I think I deserve a rest. But if I considered myself cured, my good health would probably suffer. Because I have type 2 diabetes, I know that I have to pay close attention to what and how much I eat, how much I weigh, and how much physical activity I get. Because I make sure that I regularly perform these three key tasks, I don’t need to take any diabetes drugs, don’t have any complications of diabetes, and have reduced my A1C from 14.4 to 5.4 and my BMI from 39.1 to 19.5. I have done this since 2007 by following a very low-carb diet. Consequently, I always say that my diabetes is in remission. It’s not cured. In my letter back to Jon, I thanked him for giving me the idea for this article. Then I looked into what diabetes researchers say about remission and cure. The best resource I’ve found is the report of a consensus group that met in June 2009 to discuss these issues. The full-text of this report is “How Do We Define Cure of Diabetes?” It appeared in the November 2009 issue of Diabetes Care. The group’s key finding is that “for a chronic illness such as diabetes, it may be more accurate to use the term remission than cure.” A cure, they wrote, is defined medically as a restoration to good health. Remission is “abatement or disappearance of the signs and symptoms of disease.” It also means, the report continues, having normal blood sugar levels without diabetes drugs or surgical therapy. 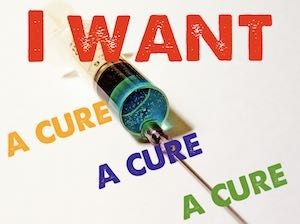 I still hope that we will have a cure for diabetes in my lifetime. If you have type 1 diabetes or uncontrolled type 2, I would rejoice with you. But I am happy right now to be in remission, and I hope that all of us who manage our type 2 diabetes realize that a cure isn’t as good for us as remission. We don’t have anything to gain by acting as if we are cured and have a lot to lose.